Looking for the chance to hear more about the research your amazing GradTerp colleagues across campus are doing—all while having a drink and some food? 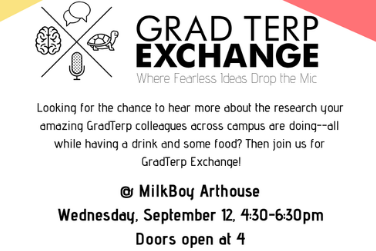 Then join us for GradTerp Exchange! Modeled on events such “nerd nites,” TED talks, or ignite talks, the GradTerp Exchange offers graduate students a unique and important opportunity to develop professional communication skills, share their scholarship, and engage in conversations with an interested and engaged audience in a more relaxed atmosphere. Graduate students and postdocs are welcome to participate as attendees or presenters.